Our neighbors in Port Townsend (Philip and Llory Morley) coined the title phrase of this post, and we love the philosophy. 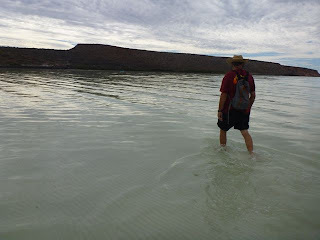 We’re back in La Paz but headed out again shortly. Karen discovered that her wallet was missing, and that she hadn’t realized it for two weeks. Total loss was about $800 in illicit charges and cash, but the inconvenience of replacing drivers license, credit cards and other items was almost as bothersome. However, that’s mostly done and we’re going sailing, north to the lovely islands again, to return in a couple of weeks for La Paz's Carnaval and our final re-provision before the Pacific crossing. There’s still much to do, but most of it is fiddly little details. When an email like this one arrives, it refreshes one’s sense of what makes a good day versus a bad day: “Later this week it is supposed to be -15ºC., and a wind chill that will take it to -27ºC. But at least the sun is supposed to shine through the ice fog for 12 minutes each day, and if I could unthaw the lines from the dock, I would have real fast sailing in the 25 - 40 knot winds they predict. 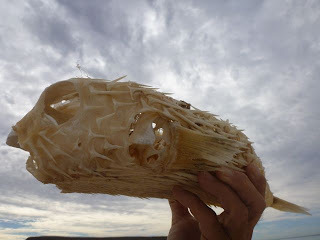 There’s that frost bite warning bit that could get in the way, though.” --from Marty and Mae of Wild Abandon in Prince Rupert, Canada. Marty also bet us we couldn’t skate on any frozen lakes in Mexico. 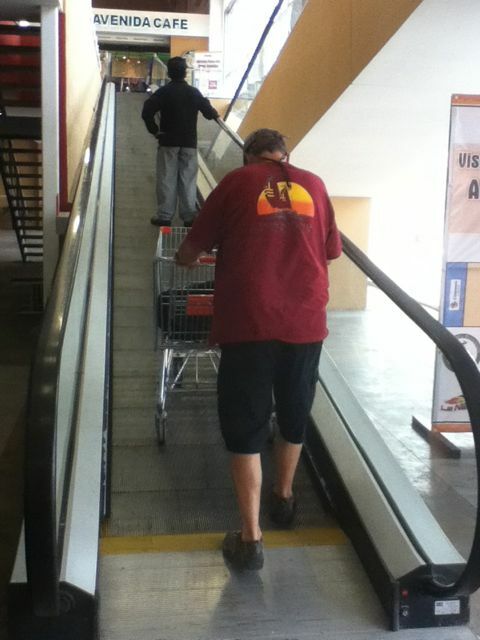 Yup, you win that one too, dude. 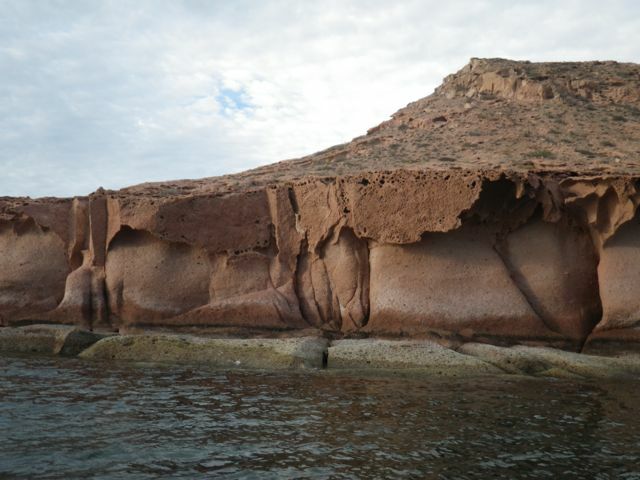 So to warm you up, here’s a photo tour of Espiritu Santo island and Isla Partida, some of the best cruising anchorages we’ve ever found. C'mon, ride ashore with us to the beach! This is Bahia San Gabriel, on the southern tip of Espiritu Santo (see the map from two posts ago.) The beach is spectacular, and the shallows go way, way out. That's our dinghy at anchor in about a foot of water. A half-gazillion desiccated puffer fish awaited us as we stepped ashore. Either there was a die-off or this is where they get blown up onto the beach in storms. This one went out in punk style. C'est magnifique, no? 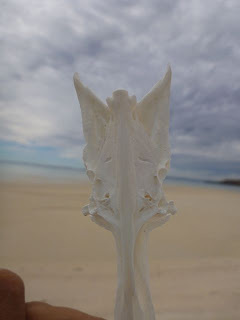 We found all sorts of treasures, but this fish bone was Karen's favorite. 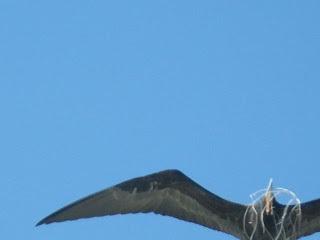 A frigatebird rookery with at least 200 individuals is located on the east shore of the bay. If you look closely, you can see some males with their red neck pouches puffed up. Females have white breasts. 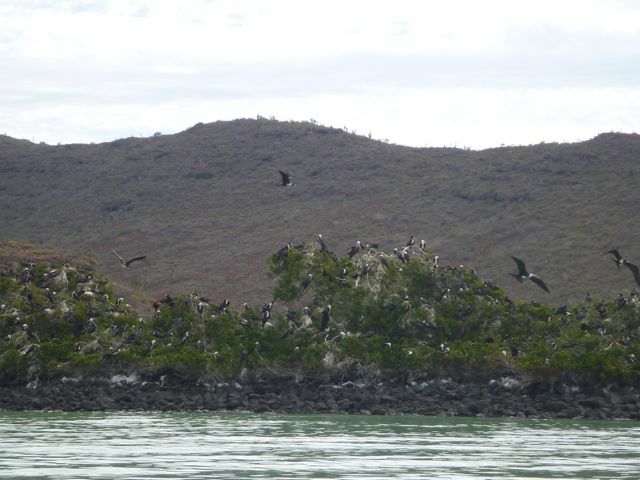 The rookery is about 200 yards long, in mangroves that front the bay. Very graceful fliers, these birds. They scoop up small fish (and can drink salt water on the fly) and they sometimes hover over other birds and rob them of their catches. 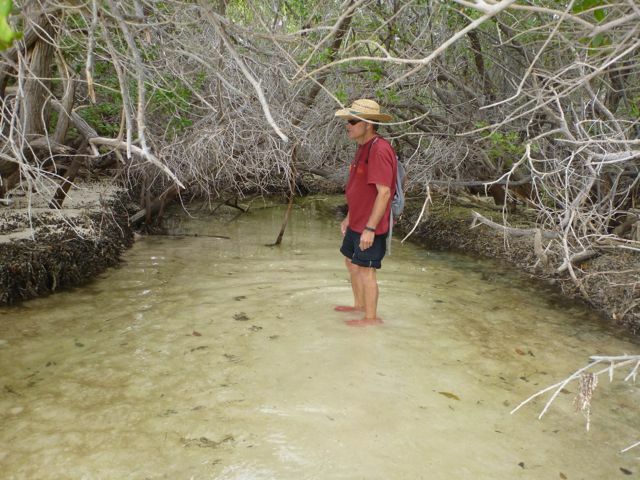 A little further to the west are more mangroves, with watery tunnels! 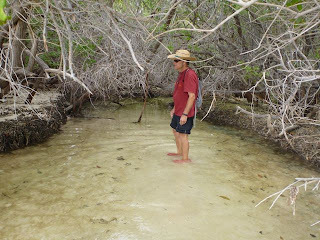 Those protuberances all over the bank are mangrove roots--very tough to walk on. 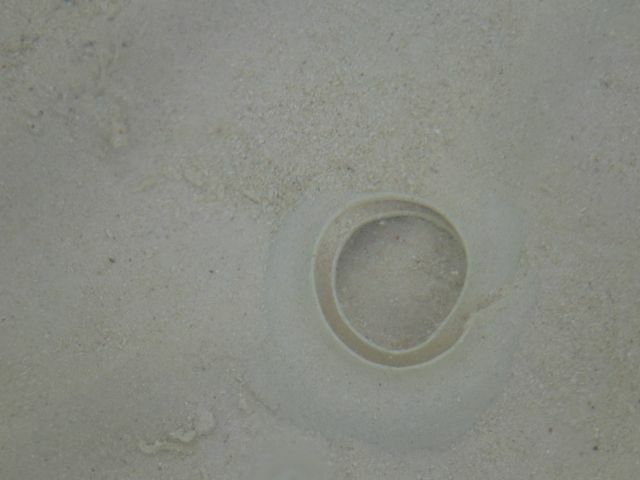 Wading back to the dinghy, we found many delicate moon snail nests in the shallows. 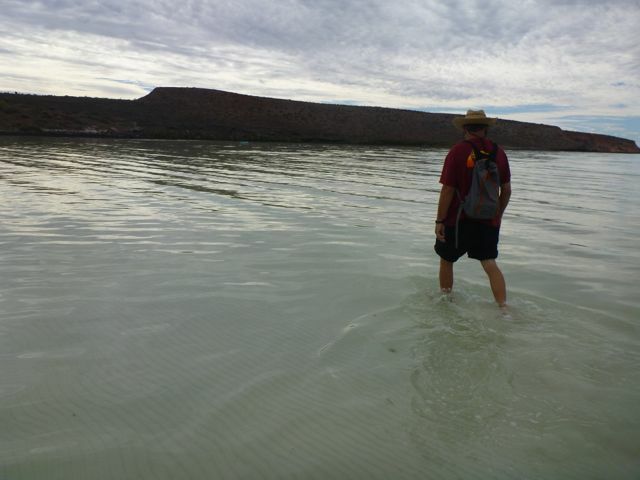 You could wade for a mile if you want to. 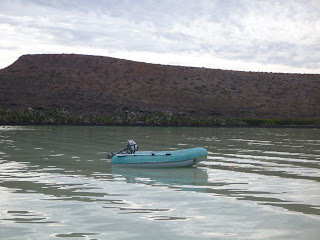 Our dinghy with its spiffy new chaps was far enough from the rookery to not disturb the birds, but near enough to see, hear and enjoy them. 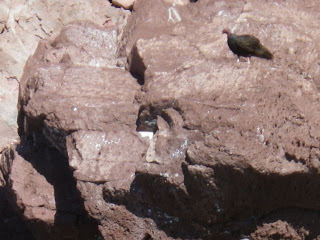 Further up the coast we found this turkey vulture perched on a rock. 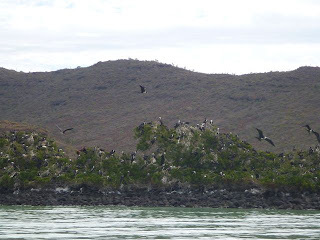 It seems that different bird species have claimed their territories; frigate birds have Bahia San Gabriel, pelicans rule at Caleta Partida, and blue-footed boobies roost at Cuervitas bay. You can anchor in each and be treated to different bird life. Cool! 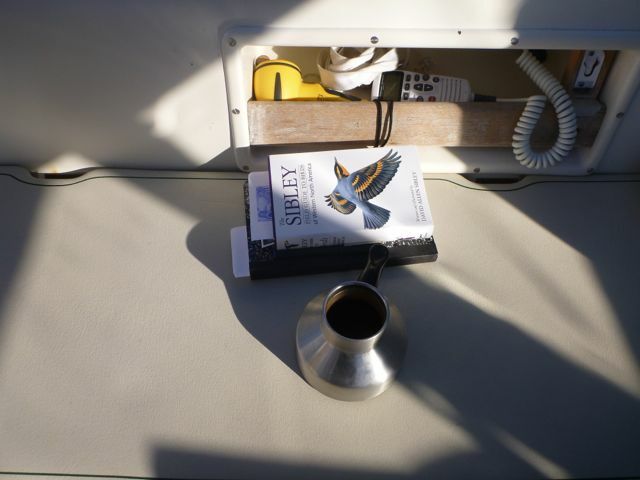 Morning coffee and birding, what's not to like? 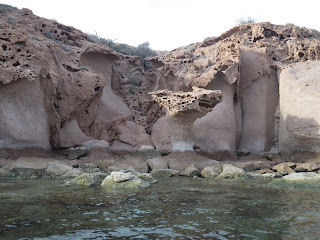 It was one of our favorite anchorages in the islands. 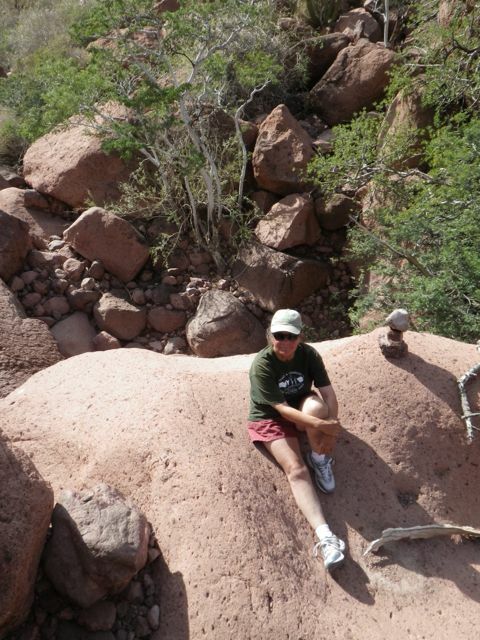 What began as a hike characterized in the cruising guide as a "stretch your legs" walk turned into 4 miles (round trip) of rock scrambling up a wash, where we gained probably 500' of altitude and followed trail markers like the cairn shown next to Karen, who, by the time this photo was taken, was pretty high on her own endorphins. 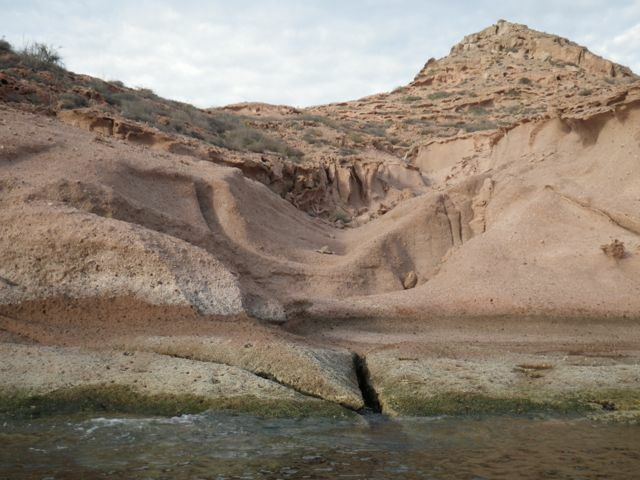 Here's the view from about half a mile up the wash. Sockdolager is just visible at the edge of the bay. Made it back down with NOTHING broken or sprained, Woot! 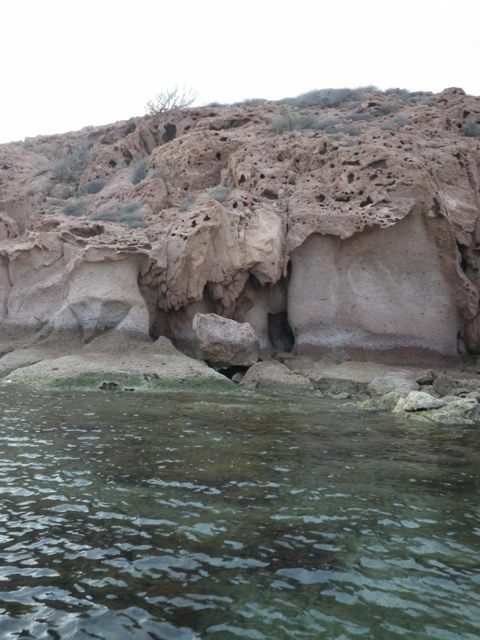 Let's go dinghy exploring again... Holy mackerel, look at these bizarre rock shapes! Or maybe praline candy. 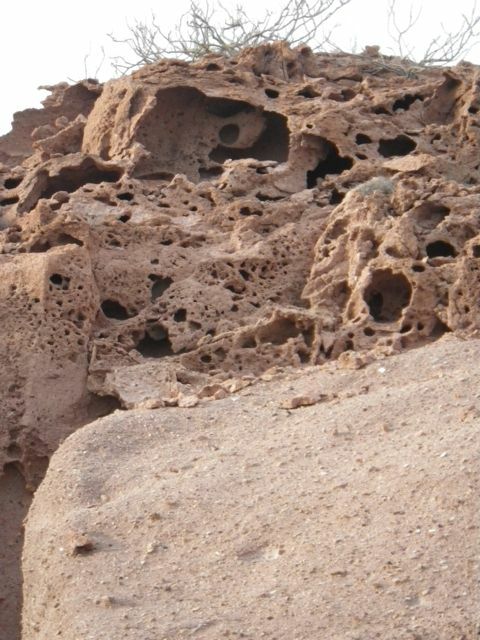 These rocks looked good enough to eat. But then again, one look at the snowpack on a glacier back in Alaska would send Karen off to an ice cream shop, so use your own judgement. There's an alien living in that cave up there. The vertical sandstone surfaces are wave-sculpted, while the horizontal ones are probably wind-eroded; maybe the sand grains get blown and arranged with some kind of interstitial glue made of salt and some calcareous material, that lets the lace "grow" much like wind-formed, horizontal stalactites. Okay, that sounds crazy. But that's my story and I'm sticking to it. 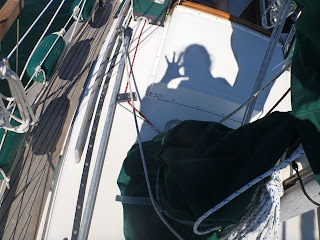 Our friends Damon and Desiree on Gia, a big steel Colvin Gazelle junk-rigged schooner, sailed by one morning. 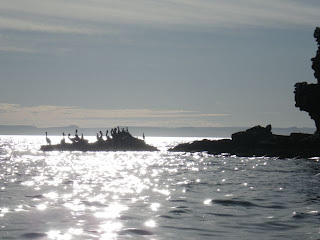 We sailed north, too. Ensenada Grande was the next harbor, and we liked the way the unusual rock-wave patterns complimented Gia at anchor. 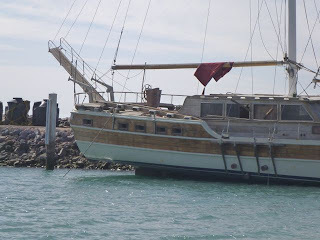 Craig McPheeters on Luckness was there, and then Buena Vista, with Don and Deb Robertson sailed in. 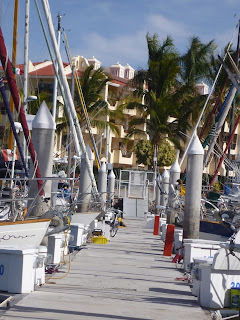 When there are that many boats around, you know what that means.... party time aboard the old Sockdolager! Buena Vista will be sailing to the South Pacific about the same time we are, and Luckness will be heading for Hawaii. 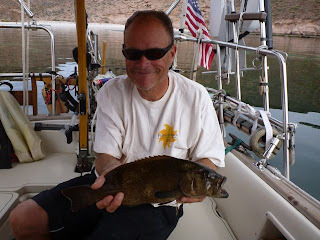 One afternoon, Jim announced, "I think I'll go catch a nice grouper," and he did. Now if you've been following the descriptions of our fishing prowess, you know this is a giant leap forward. Karen now expects to order her fish in advance. A statue we'll call "Lady Guano." 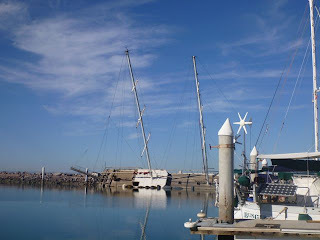 Back in La Paz at our old slip on Dock 3, we were glad to see that the sunken ship shown in this photo (masts hanging over the channel providing a hazard to sailboats) was finally raised. That's the good news. 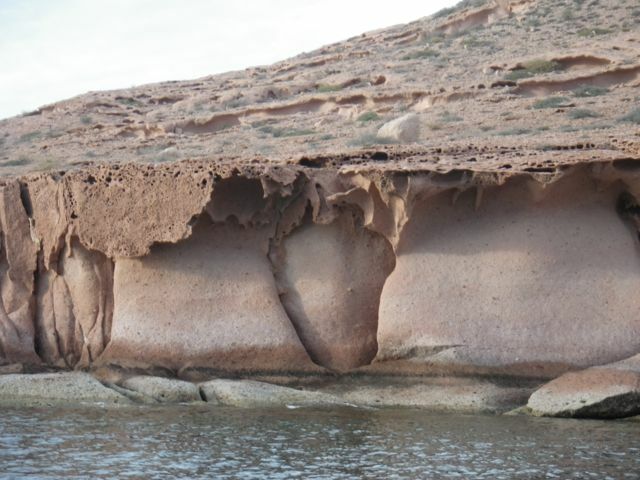 The bad news is that it's still hard aground. But the good news is that we're going sailing again tomorrow. More tide-pooling ahead. Quick update: we just saw the most amazing show ever performed aboard a sailboat. You may have heard of the very acrobatic Cirque de Soleil. 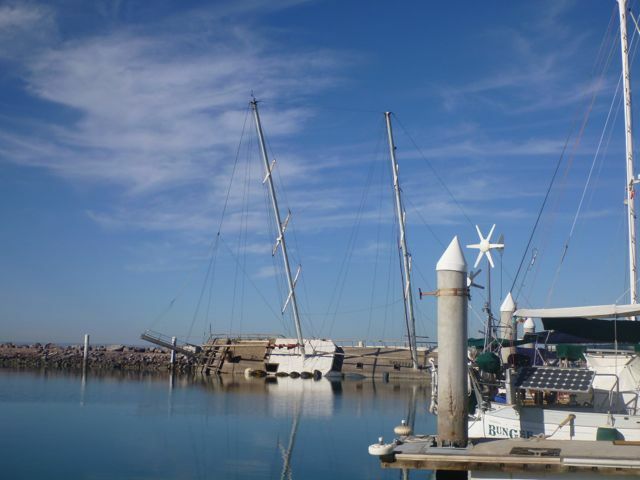 A French couple and their four active daughters are sailing around the world in a bright yellow boat named La Loupiote, and they travel to marinas and put on shows for everyone. It's all donation only, and they do an astonishing job. If you ever get the chance, don't miss it. Jim here. 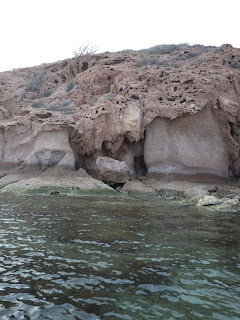 As I sit in the cockpit and look to the left and I see a sandstone rock wall and as I look to the right I see another one, covered with cactus. Behind the boat is a big white sand beach. In the distance I hear a canyon wren with its distinctive twitter. It make me think I'm on a river trip on the Green, or the Yampa or the Colorado rivers in Utah, Colorado or Arizona. 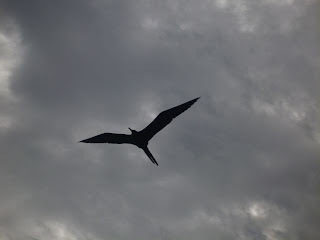 Then a big manta ray jumps out of the water in front of the boat and the illusion disappears. But all of the good memories of those many river trips with great friends remain. We are out at what are locally referred to as "the islands". 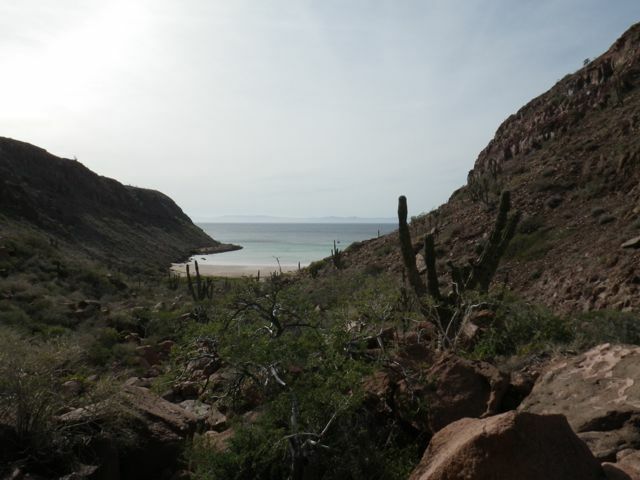 They stretch for about 100 miles north of La Paz in the southern part of the Sea of Cortez. The sea life is rich - very much enjoyed with a mask and snorkel (and a wet suit). 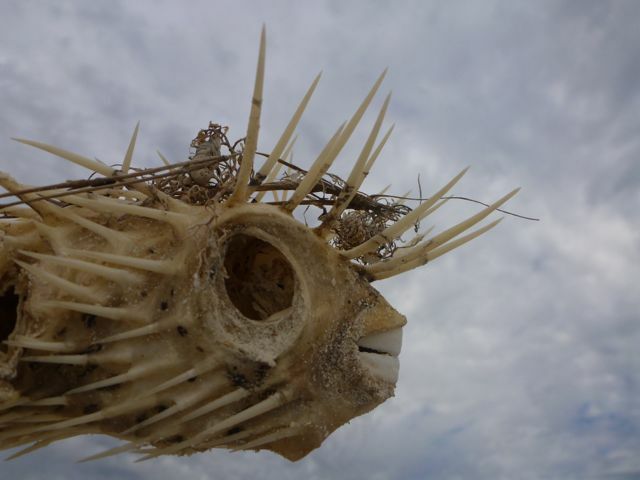 But the fish are not going out of their way to jump on my hook, however, I did catch a Leopard Grouper yesterday that made a nice dinner for three. 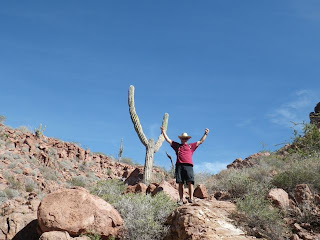 The cactus are huge and abundant. The weather is dry and mostly sunny with light shows almost every sunrise and sunset. We will be out for about three more weeks before going back to La Paz to experience Carnival and get ready for heading across the Pacific to French Polynesia. Time is flying and we are already regretting not being able to see more of Mexico. But you can't see everything so on we will go! This update sent via our high frequency radio. Island-bound: We just left La Paz and are headed north to see the islands. 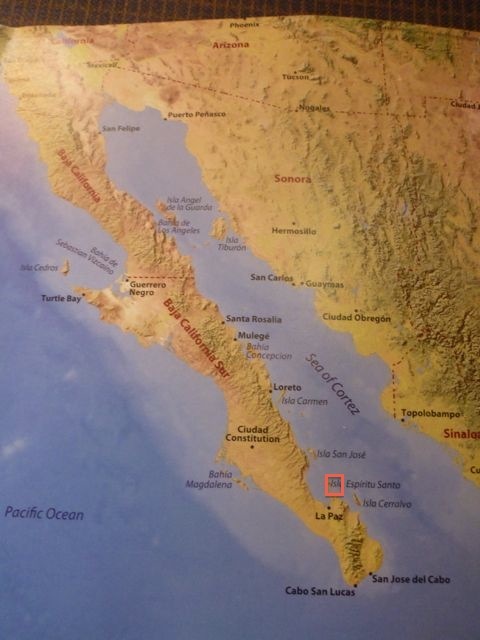 This is a photo of a map in the excellent cruising Guide called Sea of Cortez--A Cruiser's Guidebook by Shawn Breeding and Heather Bansmer. One of the best cruising guides we’ve ever used. 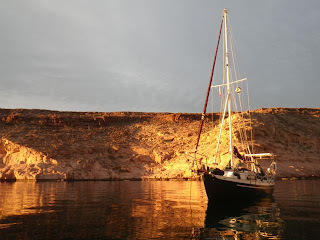 Right now we are anchored near the south end of Espiritu Santo Island, which is a Mexican National Park inside the little orange square we drew on the map. To visit here for longer than a day or two, they ask you to buy a park pass, which costs about US $25 and is well worth it. 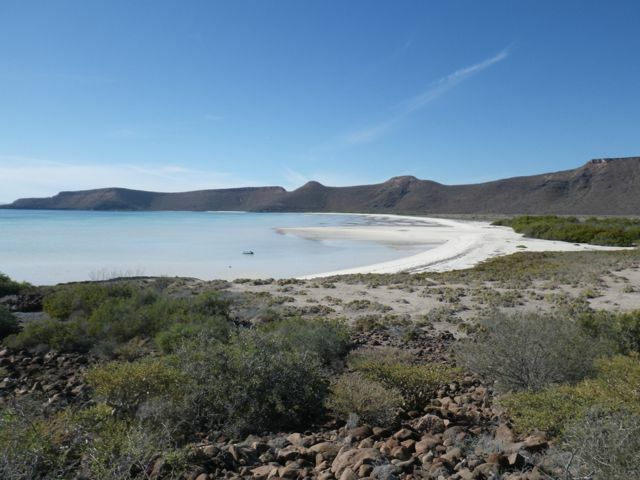 Funds support species and habitat restoration, and the Mexican government has partnered with several US-based conservation organizations to make this happen—we heartily approve! The charms of La Paz: This is our marina, seen from the mountain just above it. 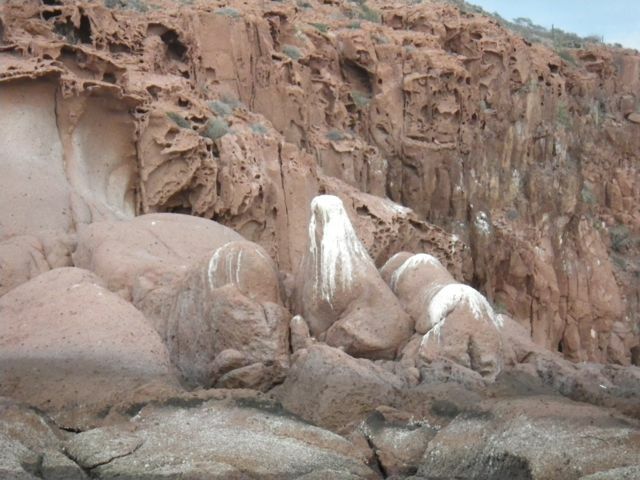 La Paz is on the left. Warm sunny days, cool starry nights, humidity very low—what’s not to like? 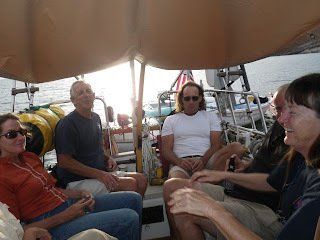 Here’s an impromptu dock concert that Karen and a fellow cruising sailor named Mary Lee, who is an excellent jazz musician, gave one evening. Being part of da gang on Dock 3 was da bomb! 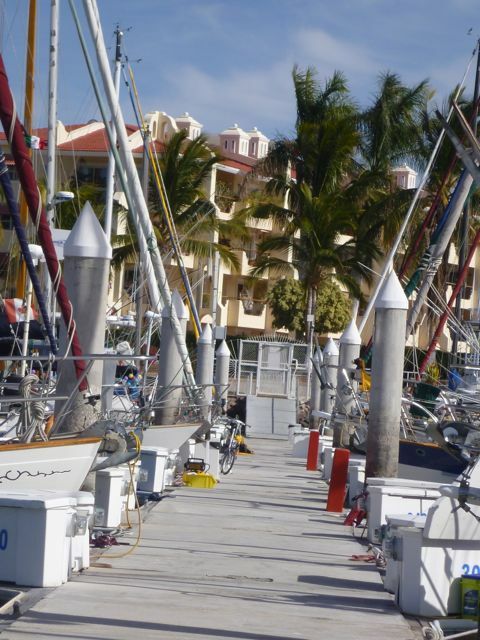 Here’s the view down the dock from our slip. 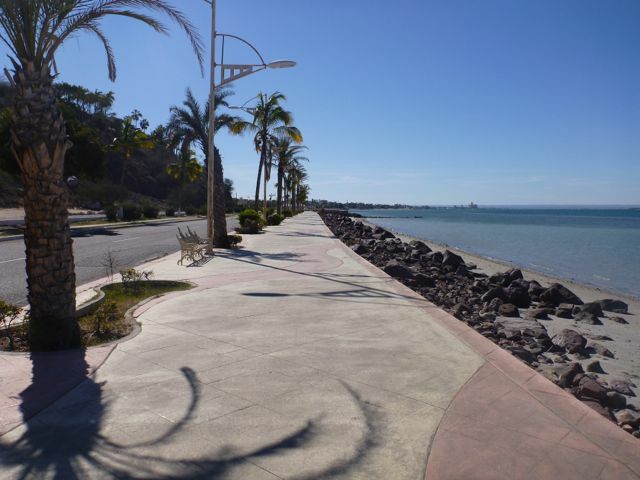 This is La Paz’s Malecon, a lovely paved seaside walkway that goes for a couple of miles. Mexican families love to come out and walk here in the evenings and on weekends. You haven’t lived until you’ve tried real fish tacos, and (oh yes, trust me) bacon-wrapped hot dogs on homemade buns with salsa. So. Darned. Good. 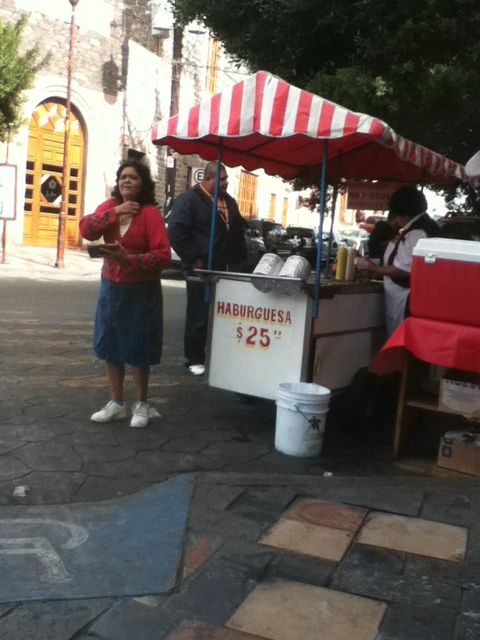 Mexican food in Mexico is much different, varied, and way better than what you get in the States. That’s the good part. The bad part is what chile rellenos and other scrumptious delights can do to, shall we say, one’s digestive composure. But to tell you the truth, it’s been worth it. They use the same symbol for pesos and dollars, but there are about 14 pesos to the dollar. This is one of the spires at the historic cathedral. Shopping at the well-stocked “Mega” store, we were amazed to see the grocery cart’s wheels grabbed by the escalator’s grooves; even a fully loaded cart can’t roll until deposited off the escalator’s other end. Cool, no? A Cruising Crossroads: With exceptionally friendly people and several thousand land and sea-based American expatriates, La Paz is a mecca for cruising sailors, and also a crossroads. In the foreground is Cetus, a Fantasia 35 with author (and fellow Good Old Boat writer) Terry Kotas and his wife Heidi aboard, from Gig Harbor, Washington. 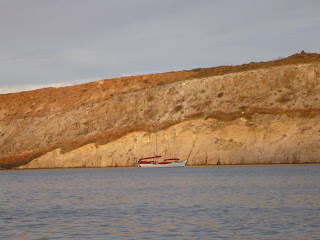 Very experienced with two Pacific crossings under their belts, they left yesterday to sail to Zihuatenejo, and then on to the Galapagos and the South Pacific. We hope to meet up with them down the ocean road. This is Clover, a wooden Lapworth 36 sailed by Shane Barry from Santa Cruz, California. He bought her for one dollar last spring, put 2,000 hours of work into her, and then sailed her to Mexico. 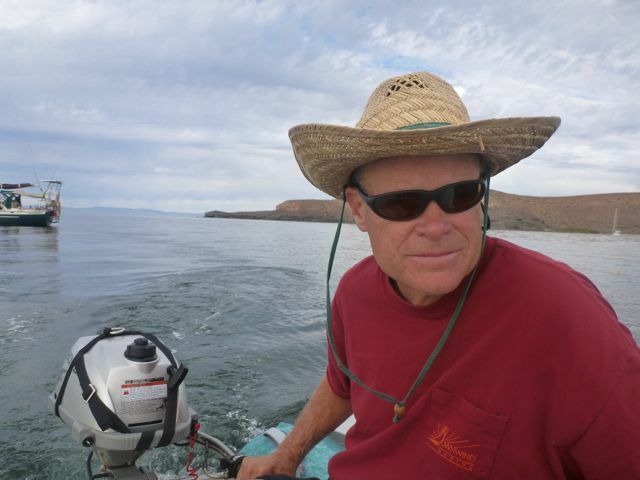 He’s never sailed before, but he just figured it all out on the way. And he’s fixing her up to go even further. Wow. We first met Shane in Los Muertos, where Clover, Sockdolager, and Luckness rode out the gale together. Here’s part of the gang we named “Team Muertos” back ashore after the Christmas gale: that’s Craig McPheeters on the left, Shane Barry in the middle, and Karen at right. Jim, the 4th member, snapped the photo. This part of the world is so lovely that to see it as quickly as we’ll see it can cause regrets. “You need to spend a whole year in Mexico,” friends tell us, and they’re right. Many cruising sailors make it this far and say, why do I need to go further? This is the perfect cruising place. 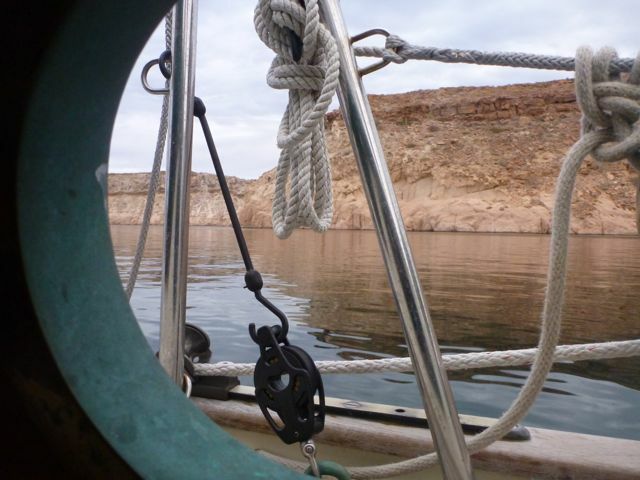 You learn a lot about your boat and yourself sailing down here, because it's not a cakewalk. 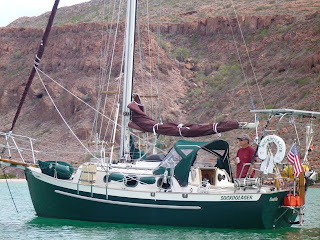 Several sailors we know, who sailed down from the Northwest, have sold their self-steering wind vanes and other gear, intending to make this their home base for cruising. Some have realized that long offshore passages are not what they like doing, and have readjusted their plans. 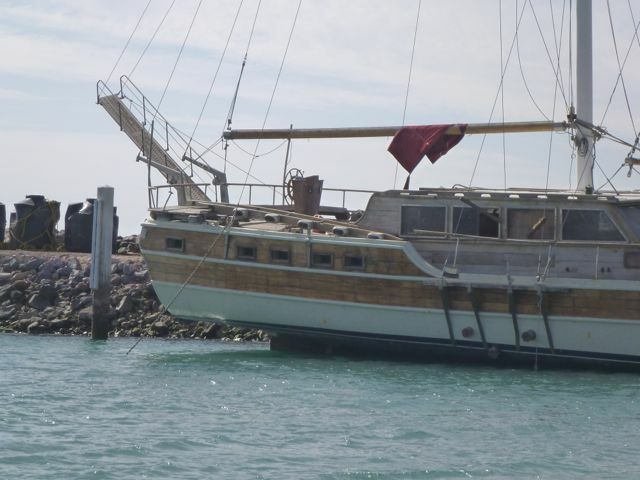 Others have honestly assessed their boat's capabilities and found the boat not up to the rigors of more offshore work. It takes honesty and courage to re-think your dream when experience tells you it's not what you expected. 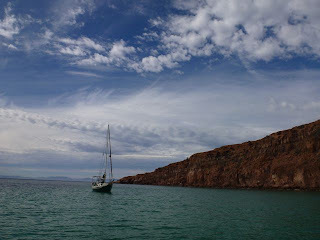 Other sailors have come back to the Sea of Cortez after crossing oceans, because they like it here. Still others stay at the dock and rarely leave it, which gives an RV-Park flavor to some places. Immediate and future plans: There is so much to see in the Sea of Cortez, and we’re off to go explore for a month, with books by Steinbeck, Ricketts, and Sylvia Earle in tow. We do regret that we won’t see it all. But sailing is about choices, and we’ve had to make some. 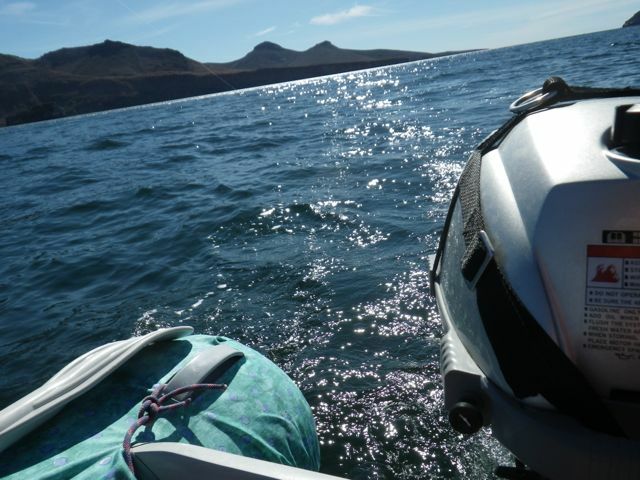 Since we don’t relish the idea of being here in summer when, as one friend told us, the temperature can climb to 135 degrees in a boat's cabin, and since summer is hurricane season, and since Mexico gets its share of them, some of which reach the Sea of Cortez, we won’t be spending the summer here. But you already knew that. The South Pacific beckons. 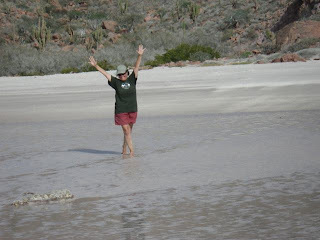 We signed up for the Pacific Puddle Jump, and will be departing Mexico this spring for the Marquesas, the westernmost islands in French Polynesia about 3,000 miles away. And we’ve moved the departure date up a bit, to early March, perhaps as early as March 1st. The reason is that 2012 is so far a La Nina year, and there has not been a named storm in the part of the Pacific where we’ll be sailing during La Nina; only El Nino. We’d like to arrive as early as possible so we can spend as much time there as possible before the southern hemisphere cyclone season arrives. 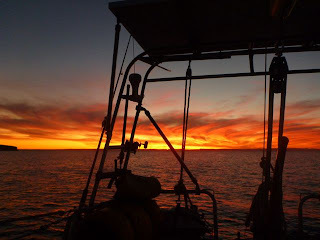 Our friends mark and Nina on Woofie, and Livia and Carol on Estrellita have also signed up and will be sailing to the South Pacific this spring, ya-HOO! 1. The Mexican mainland is a couple hundred miles east of here; our course to the Marquesas will be west-southwest. The distance out to the trade winds from the Mexican mainland is several hundred miles, with calms predominating; we can’t sail very far or fast in a calm, and we don’t want to use up all our fuel (only 20 gallons) so early in the voyage. This could add several days to our passage. 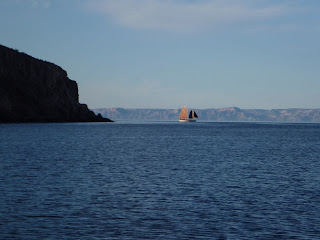 From Cabo San Lucas it’s less than a hundred miles to the trade winds, with reliable northerlies taking us there. The distance to the Marquesas is also shorter from Cabo than from the mainland; we estimate a 30-day passage but will have provisions and water for 50% more. 2. 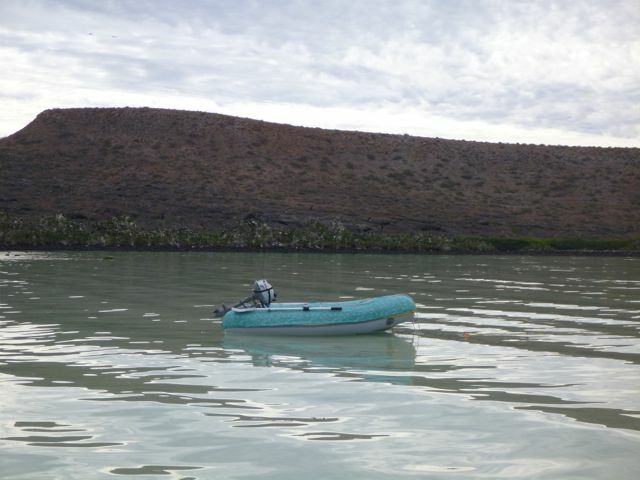 We carry 40 gallons of fresh water in our main tank and will have another 15-20 in portable containers; our average consumption is 1 gallon per day on passage because we wash dishes, ourselves, and do other chores with the clean salt water you find at sea. 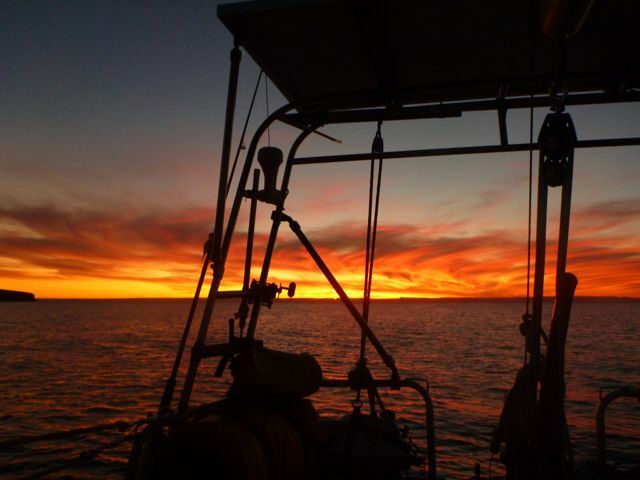 A longer passage would stretch our supplies, so it’s in our interest to not lengthen the time at sea. 3. 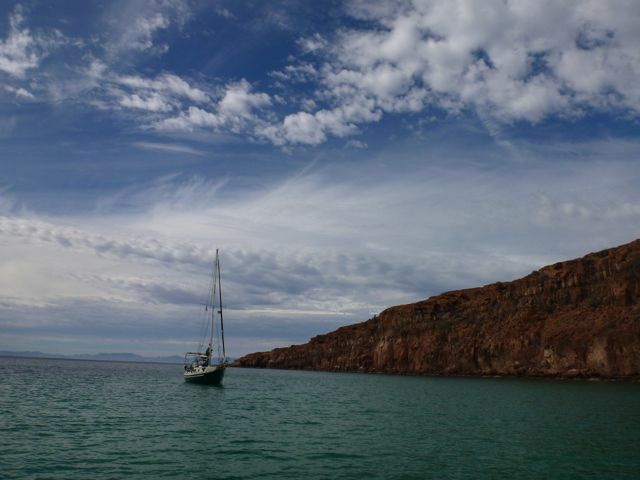 Sailing over to the mainland would mean we’d have to miss the Sea of Cortez almost entirely or rush around like madmen, neither of which we want to do. So what’s left to do to get ready? Well, not much, actually. 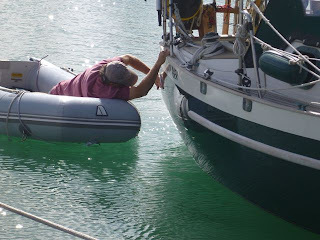 We’ve done most of our big projects and are left with cosmetic maintenance and fiddly bits, which we’ve described in a new page on the left side of this blog. 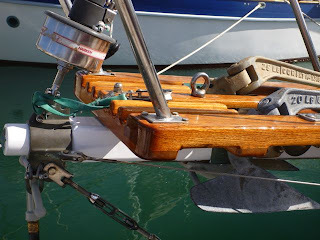 Two coats of paint and varnish made the bowsprit and platform shine. 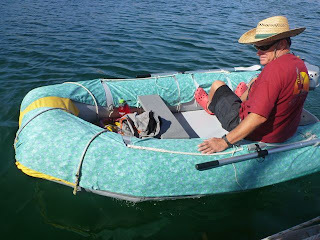 A few days’ worth of snipping and sewing was all it took to make a set of chaps for the dinghy (oh yeah, and one very sore right shoulder—this was all done by hand because we don’t have a sewing machine aboard.) They really should be made of canvas, but Karen decided to experiment with cheaper fabric first, which can then be used as a pattern later. Chaps protect the inflatable dinghy from tropical sun (our dinghy’s made of hypalon, which is more sun-resistant than PVC) and they also protect against chafe and wear against rough docks. Plus, they’re unique and colorful. 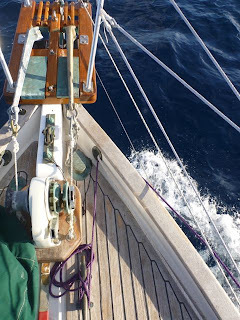 Inkslingin’ continues: Karen’s article, “Rode Show” is in this month’s Good Old Boat magazine (page 34) and she is working on a series of feature pieces for GOB, on solo sailing. You’ll also notice another new page to the left of this column, called “Book Reviews.” Karen will be posting them every so often, We hope you enjoy the reviews, and perhaps even the books themselves.